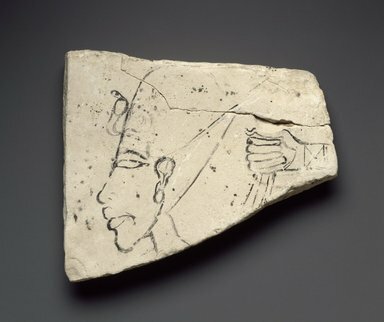 Limestone trial piece with ink sketch of the head of Akhenaten and to the right a clenched hand. The king wears the elongated crown with royal uraeus. His features include the usual long skull, very full lips and receding forehead. . Condition: A large fragment has been glued in place at the top of the piece. A small chip is missing at the thumb. The upper part of the drawing of the crown is very faint.